At Absolute Home Improvements Inc. we pride ourselves in knowing we can provide a lifetime workmanship warranty and honor it. We have some of the best installer in South Eastern Wisconsin and that’s why we can stand behind their work. 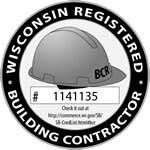 Not many Milwaukee contractors can match our no-hassle lifetime workmanship guaranty or the quality of our work. If at any time you do have any issues with our work, there’s no need to break a sweat because we are here to fix it and make it right. Free of charge for the lifetime rating of any products we install. We guarantee it! !